Tintin in the Congo is the second comic of Adventure of Tintin series. The comic published weekly from May 1930 to June 1931 at Le Vingtième Siècle for its children's supplement Le Petit Vingtième. Shortly after return from Soviets Tintin and Snowy sent to the Belgian Congo to report on events in the country. Amidst different encounters with the indigenous Congolese people and wild animals, Tintin unearths a criminal diamond smuggling operation run by the American gangster Al Capone. This is another most criticized Tintin comic after Tintin Land of the Soviets. Here we see the color of colonialism. Tintin represented progress and the Belgian state was a model for the natives to imitate. Tintin shows a disgraceful attitude towards the natives. In 1954, as Hergé revised the story, the racist attitude would soften (but here original version uploaded). Tintin shows little respect for the wild life. 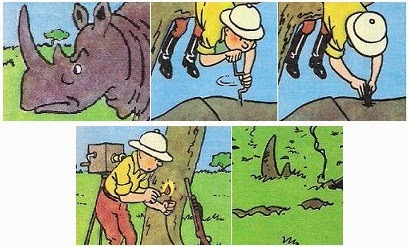 Over the course of the Adventure, Tintin shoots 13 antelope, kills an ape to wear its skin, rams a rifle vertically into a crocodile's open mouth, injures an elephant for ivory, stones a buffalo, and drills a hole into a rhinoceros before planting dynamite in its body, blowing it up from the inside. Such scenes reflect the popularity of big-game hunting among whites and affluent visitors in Sub-Saharan Africa during the 1930s. If you are a naturalist, You are probably not going to like the comic!